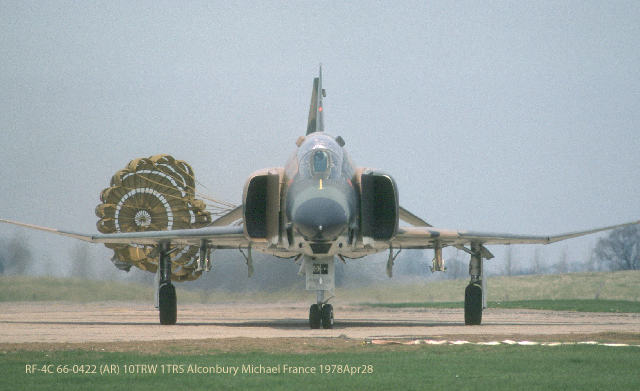 In 1964 this was the brand new reconnaissance version of the F-4C. The first operational unit flying the RF-4C was the 16th Tactical Reconnaissance Squadron (TRS). The 16th TRS stood up on 18 Jan 1965. Eight months later the 16th had an Operational Readiness Inspection. Sixty days later the squadron was in Saigon, Vietnam, at Tan Son Nhut Air Base. All of the pictures in the above pages were taken by Kirk Ransom, unless otherwise noted. All the pictures were 35 mm slide film. The cameras used were Contax II rangefinder camera in 1964/65 and a Pentax Spotmatic SLR (and several other Pentax models) from 1965-1997. RETURN to the main page The RF-4C is a two place (tandem), supersonic, all weather, day and night, tactical reconnaissance platform. The mission is tactical reconnaissance - in the theater of operations - where ever that is. The R in RF-4C is Reconnaissance. The F is for Fighter. The 4 is for the series and C is for the variation. So the mission is reconnaissance - taking pictures. Basically after the fighters have bombed a bridge, after the smoke had cleared, the RF-4C goes over the target to photograph it to see if the fighters hit it. The airplane has a crew of two: the pilot and the Weapons System Operator (WSO). The pilot is in the front seat and the WSO is in the rear seat. The pilot is flies the airplane and the WSO tells him where to fly. To accomplish the mission, the RF-4C is equipped with there reconnaissance systems: optical, infrared and side looking radar. For optical photography, three camera stations are in the nose of the aircraft with six windows for up to six cameras. Normal configuration would be three cameras. OK, for all you young people who have only seen digital cameras - it is all about FILM, photographic film. The RF-4C first arrived in the Air Force in November 1964. At that time everything, - all the cameras and other reconnaissance systems used FILM. Big rolls of photographic film - between 500 and 100 feet in each roll. This film had to be processed in chemicals to produce a NEGATIVE. In the forward station (also called station 1) would be a KS-72 (or later the K-87) camera called a framing camera. Like all the systems, this camera used film five inches wide, so the 'picture' or frame would be 4.5 inches square. This camera could look forward to take pictures as you approached and flew over a target. The camera could also be mounted to look straight down or vertical. The vertical position would normally be used for night photography (using flash bulbs!). In the center station, also called the low altitude station (and station 2), was the low altitude panoramic camera: the KA-56. This camera used a rotating prism under the lens that would produce a picture from horizon to horizon perpendicular to the flight path (a 180 degree field of view). The picture was 4.5 inches by about 10.25 inches. Station 2 could also have KS-72/87 looking out the side oblique windows. In the last or high altitude station (also called station 3), was the KA-55A camera. This camera used a long (12") very high resolution lens. It was also a panoramic camera with a 90 degree field of view The negative was 4.5" by 18.9". This camera was mounted in a gyroscopic stabilized mount. Only ever other RF-4C was equipped with the KA-55A. Other cameras could also be used in station 3 such as the T-11 mapping camera. This camera use 10 inch film with a 9 inch picture format. Also two KS-72 or KS-87 could be mounted in "split vertical" mount with the two cameras with 12" or 18" lens pointing left and right but overlapping a bit. Here is an RF-4C taxing into to the parking ramp. He brought the drag chute with him and will drop it after he completes the right turn. You can see the attachment line of another drag chute on the ground. And you can see the forward oblique camera window below the radome. 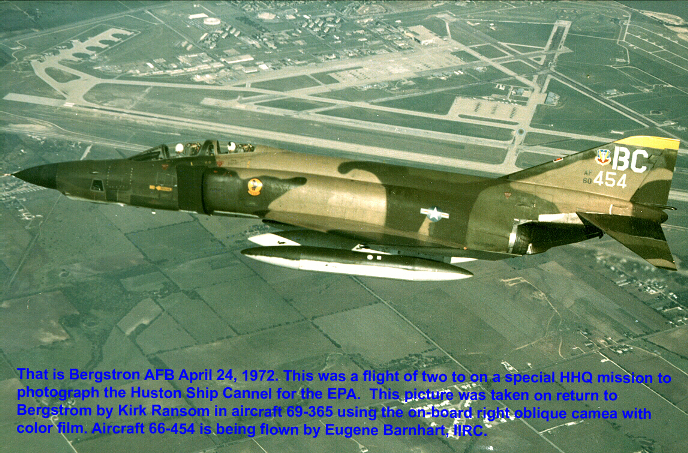 About Kirk and flying the RF-4C.